Gamers with more money than skills can now trade the former for the latter with paid lessons from top-ranked professional Super Street Fighter 4 players on Xbox Live and the PlayStation Network. When I was a kid, I took piano lessons. It never went anywhere because I absolutely detested practicing (a work ethic that got me where I am today) but maybe I'd have been more amenable to the idea if the lessons were for something I actually enjoyed, like, say, videogames. But come on, who's going to pay for videogame lessons? Maybe somebody, especially if the teachers are "top SSF4 players" Justin Wong, Mike Ross, Martin "Marn" Phan and Ryan "Gootecks" Gutierrez. 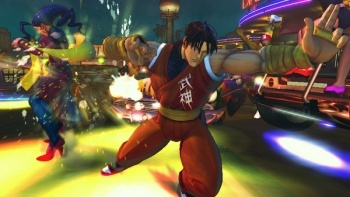 The four are offering paid lessons at a rate of $40 to $50 per hour, primarily on Xbox Live (Gootecks is also available on PSN), and each with a focus on a particular set of characters: Wong offers lessons in "tournament level characters" Rufus, Abel, Balrog and Makato, Ross handles E. Honda, Ken and Blanka, Phan specializes in Dudley, C. Viper and Abel, and Gutierrez does Balrog, Guile and Rose. According to the quickie FAQ on EventHubs.com, payments must be made through PayPal at least 24 hours before the lesson is scheduled to begin. Skype is the preferred method of communication between student and teacher, and lessons will focus on each player's individual needs and interests. "It is your responsibility to tell your instructor what you need help with or want to know more about," the FAQ says. "If you have videos from a recent match that you want feedback on, please mention that in your initial email." Forking over cash for videogame lessons apparently isn't anything new, but what makes this noteworthy is the "high profile" of the tutors. Wong has been a fixture at the Evolution Championship Series (aka Evo) since 2003 and took top spot in the Marvel vs. Capcom 2 competition in 2010, while Phan earned first place in Tatsunoko vs. Capcom and Ross placed fourth in the Super Street Fighter 4 competition. Gutierrez is also a top-ranked professional Street Fighter player who has launched several competitive tournaments and is set to appear, along with Ross and Wong, in the "fighting videogame scene documentary" I Got Next. It's an impressive faculty, but 50 bucks an hour to learn how to play a videogame? Call me old fashioned but I think I'd rather pay for a year of Xbox Live Gold and figure it out for myself.